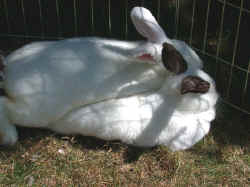 Now that's a Big Bunny!!!! 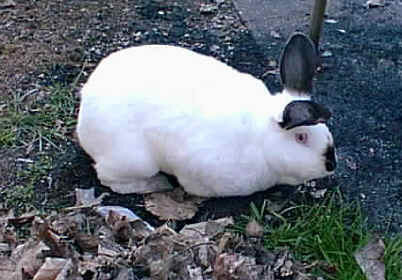 I rescued this bunny on Saturday evening, January 9th, 1999. This bunny came to my attention through another member of PetBunny. 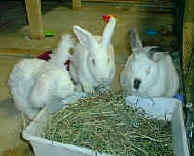 I contacted the Ashtabula Humane Society and the woman brought several of the bunnies out to my home. She explained that there were many bunnies taken from a mans shed. The shed had no light in it at all and the bunnies were only being fed a few times a week. There were 10 bunnies in the shed when they were confiscated. Within 2 days, 3 of the females had given birth but one of their litters died. 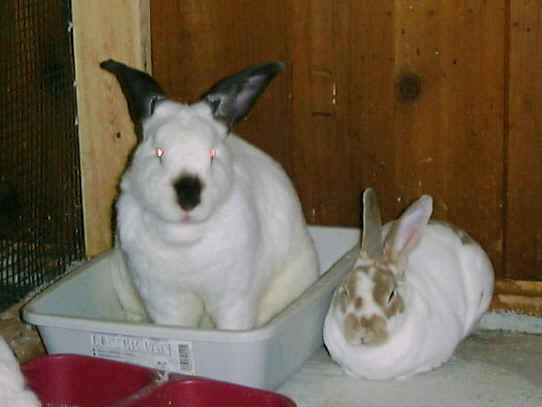 We adopted Big Bunny and Vincent who were 2 of the dads. 8 weeks later, we adopted Daffy who was the baby of Big Bunny and Big Mama. Big Bunny weighed around 12 pounds and was very sweet. 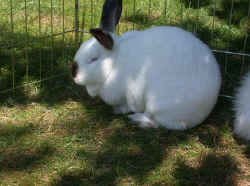 Big Bunny was a Californian rabbit and he looks just like my bunny Peter only he is MUCH larger. Big Bunny lived happily with Dazzle, Daffy, Sweet Pea and Casper. These 2 pictures show Big Bunny and you can see his son Daffy. In the first picture, Big Bunny is enjoying his apple stick that we ordered from Bunnyluv. All of my bunnies adore these sticks. 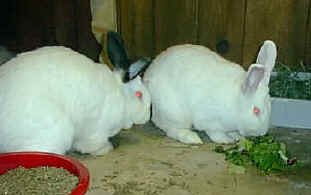 The other picture shows the bunnies enjoying a salad. Update: Big Bunny left very suddenly for the bridge on 10/24/02. 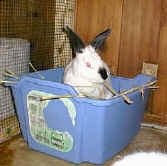 He was not one of the bunnies that had been sick and showed no signs of illness until the evening of 10/23/02. 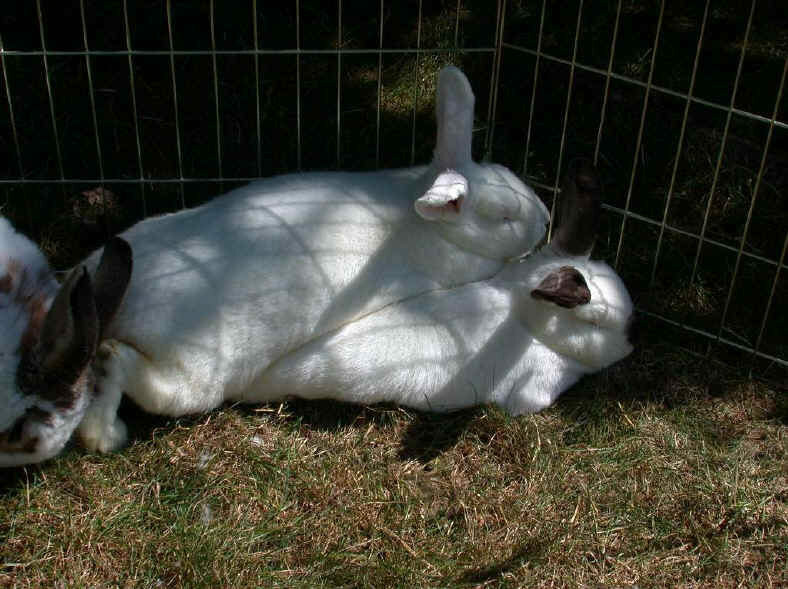 He had been receiving daily antibiotic shots like the rest of the bunnies but apparently, this wasn't enough. The food sample that I sent to the State Veterinary Lab in Pennsylvania came back positive for 2 of the 4 mycotoxins that I asked them to test for. 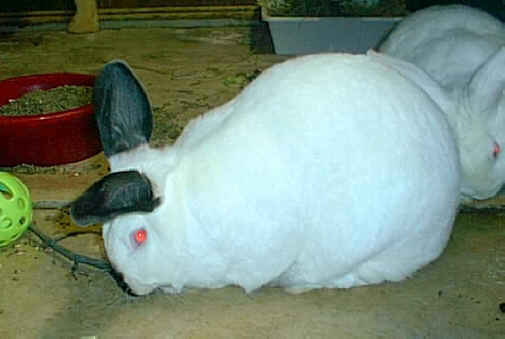 We will be sending Big Bunny to this lab to test his organs specifically for mycotoxins. Pet Supplies Plus REFUSES to remove the food from their shelves and said they have no intention of doing anything about it. They told me to call the home office and they told me to call the distributor. Nobody seems to want to acknowledge this even with the lab proof I have. I will be buying a fresh bag of the food tomorrow to send for testing again to see if the food still on their shelves is contaminated. I am calling the state of Ohio's Department of Agriculture to inform them of the situation and the store doesn't want to take any action. To read the fully story of all the bunnies and mycotoxin poisoning, Click Here.